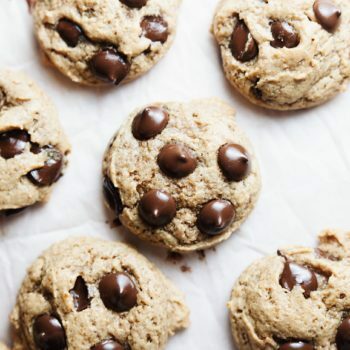 This healthy chocolate chip cookie recipe is the perfect guilt-free indulgence! No refined sugars, gluten free, and dairy free. These cookies are super chewy and soft, peanut buttery, and are melt in your mouth delicious! 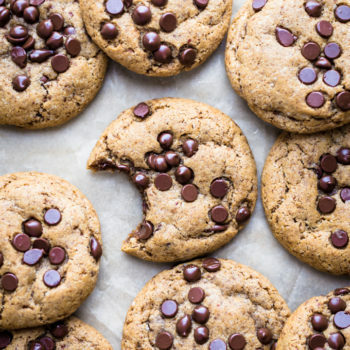 This healthy chocolate chip cookie recipe needs to be in your life. 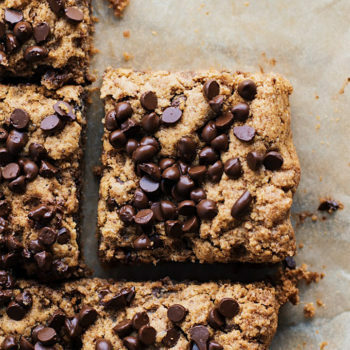 If you are a fan of cookies that are fudge-y, chewy, and filled with gooey chocolate chips, these will be your new dessert obsession. 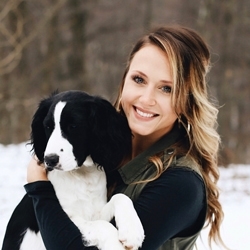 But you may be asking yourself “what makes them healthy?” I’m glad you asked. These cookies have no white flour, no butter or oils, and are free of refined sugars. They may be on the healthier side, but are completely addicting and decadent. Use peanut butter as a binding ingredient. 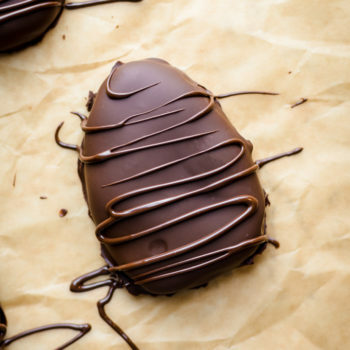 Peanut butter is so versatile in baking. Most times it’s used to add flavor, but in this recipe I also use it as a binding and softening ingredient as well. 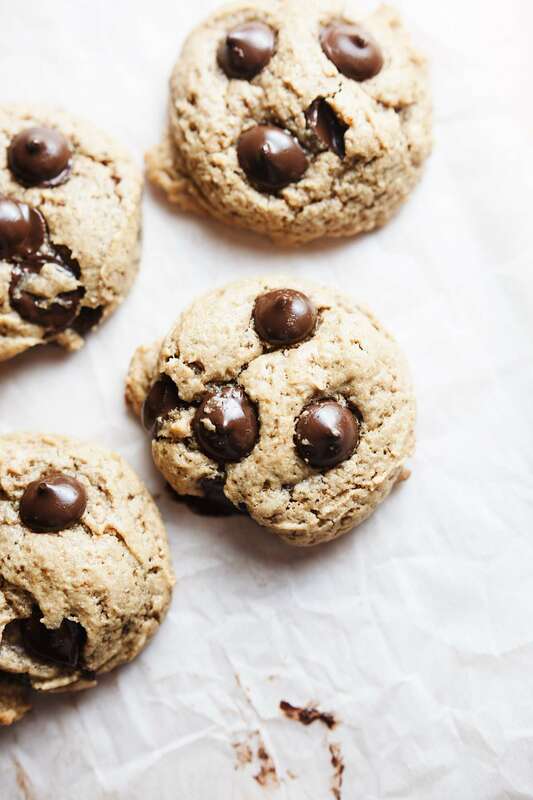 It responds well in gluten free cookies – rather than melting, it holds ingredients together and gives a moist texture and buttery creamy flavor. Replace wheat flour with finely ground almond flour. Almond flour is ground very fine and almost mirrors the same consistency as wheat flour. It’s still a nut flour, but it works so well as a flour replacement, is perfect for gluten free/vegan recipes, and is an excellent source of protein as well. Refrigerate for more chewy consistency. These cookies are refrigerator and freezer friendly. Since they are more on the soft side, I recommend refrigerating your cookies in a sealed container to keep fresh but also to develop an even more chewy texture. 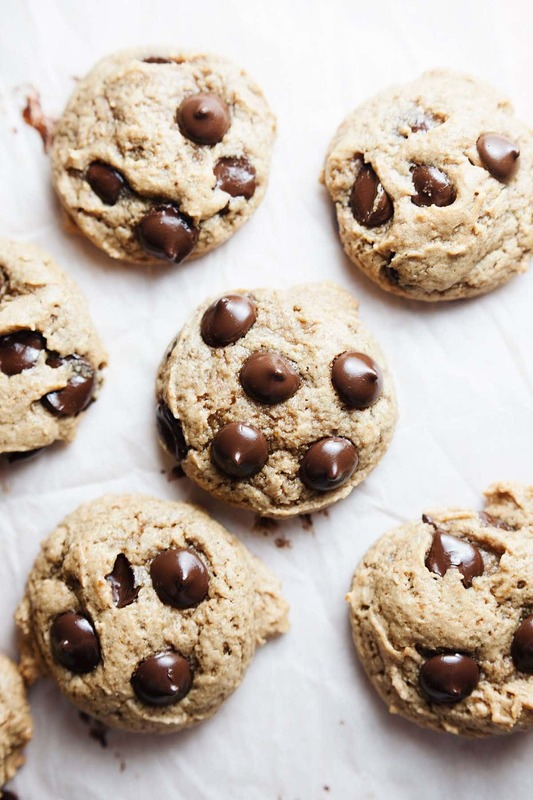 A batch of these healthy chocolate chip cookies don’t last more than 24 hours in our house. My husband and I both enjoy eating something sweet after dinner with coffee, and it always helps when it’s something that’s a little healthier. 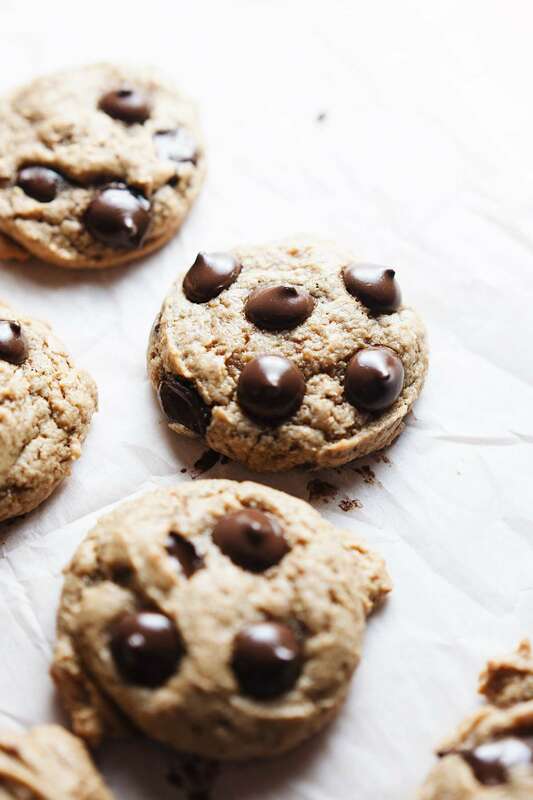 These cookies have been a go-to as of late, and our obsession probably won’t be stopping anytime soon. If you enjoy recipes like this one, you may enjoy my Healthy Protein Cookie Recipe, also healthy and yummy. 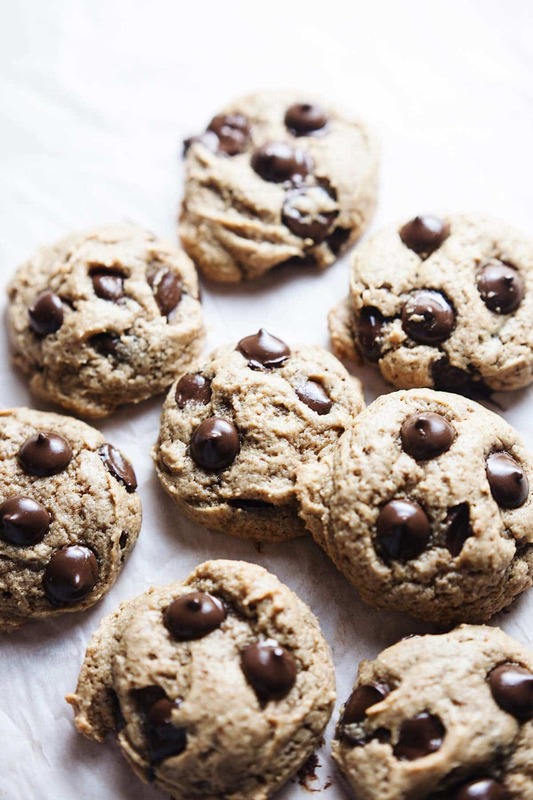 Soft and chewy Healthy Chocolate Chip Cookie Recipe! Clean ingredients, no white flour, no refined sugar, and the perfect healthy indulgence. Mix in electric mixing bowl: peanut butter, vanilla, coconut sugar, eggs. Mix until smooth. Add baking soda, almond flour. Hand mix chocolate chips in last. Place bowl of cookie dough in refrigerator for 15 minutes so dough slightly hardens. Use a greased cookie sheet or line cookie sheet with parchment paper. Use small cookie dough scoop or a regular spoon to scoop dough into balls. Place 2 inches apart from one another. Bake cookies for 8-10 minutes. Let cool for 10 minutes. Store cookies in sealed container in refrigerator for extra fudge-y texture. Depending on the size you shape your cookies - this recipe yields 12-18 cookies. These are the BEST!! So nice to now have a healthy cookie recipe – thank you! !